The beginning of a new year is the perfect time to turn over a new leaf. Why not start by making a fresh commitment to your dental health? Your dentist in Palm Bay can help, either through routine care, cosmetic smile enhancement, or both. Brushing, flossing, and limiting sugar consumption can reduce but not eliminate your risk of cavities and gum disease. Enjoying the best protection from plaque and tartar requires periodic trips to your dentist’s office. Many health conditions first show up as symptoms inside your mouth or throat. It’s easy to overlook these warning signs until they turn into serious problems. Knowing the difference between a minor spot and major cause for concern takes professional dental expertise. The only thing that stays constant about the world of dental coverage is that it’s always changing. You may think that your care provider has your current information. But, if you’re wrong, you may find yourself facing frustrating delays just when you need care the most. Making an appointment allows you to double check, setting your mind at ease. Fortunately, most people only need to see their dentist a couple times a year for a routine exam and cleaning. If you haven’t made your appointments for this year, then why not do it now? There will never be a better time. Teeth whitening. 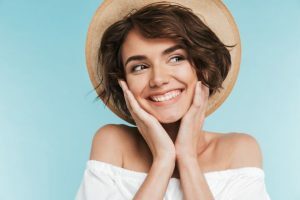 This is a gentle, comfortable process that allows you to relax while a dental professional uses prescription-grade products to remove built-up stains and discolorations, bringing out your smile’s natural beauty. You’ll see visible results in as little as one treatment. Dental veneers. Ever wish you could start all over with a brand-new smile? Say hello to veneers, which conceal the appearance of yellowing, staining, chipping, lack of symmetry, and other cosmetic dentistry concerns. This is a great option for people whose teeth are basically healthy but who want a makeover for their smile. Sometimes the only thing keeping your smile from being its best is a few lines or wrinkles on your face. That’s why we’re excited about Botox therapy, which relaxes the muscles that contribute to frown lines and other cosmetic imperfections. This is a great way to enjoy maximum benefits in minimum time. The beginning of a new year is the perfect time to invest in yourself. Whether you’re in need of a renovated smile or just routine care, you’ve got a world of benefits waiting for you at your dentist’s office. Make your appointment today; then get ready for a better tomorrow. Dr. Christopher Nowacki has been practicing dentistry for over 15 years. He’s a proud member of the American Dental Association (ADA) and the Academy of General Dentistry. You can reach his office online or by calling (321) 724-9300.